If you're looking for easy-to-use intranet software for your School, College, or University then you've come to the right place. 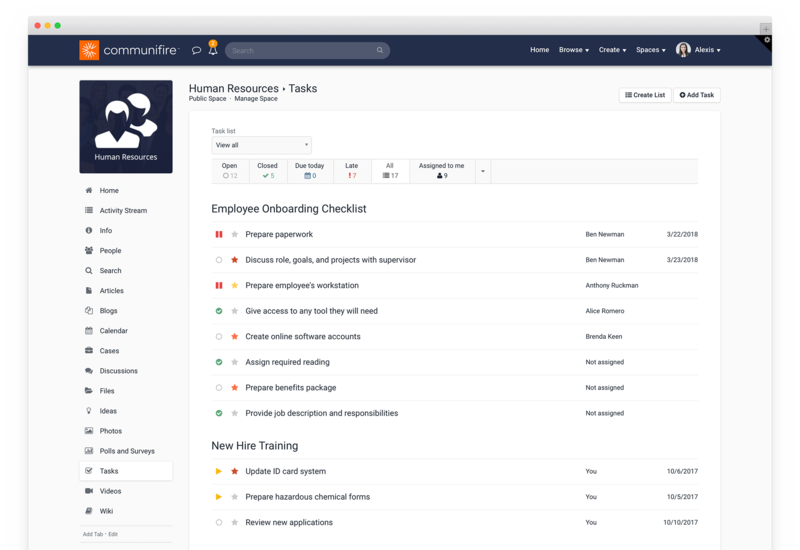 Communifire is an integrated set of tools that you can use to connect your people, organize your work and get things done. We'll walk you through the product and answer any questions you have. Imagine the ease of collaboration. The free flow of conversation. The sharing of knowledge. This is your small business intranet powered by Communifire. "Communifire is the foundation for running our schools. Not only does it facilitate our administrative staff collaboration ... it helps our students with course work and the surrounding content and conversations. But ultimately, it gives our students a place to get help from their peers and teachers." 99% of Communifire customers are still actively using the platform after 5 years. Launching an intranet for your company is easier than ever. With a little bit of planning and forward thinking, you can be up and running in a few days. Here's a list of best practices for a smooth implementation. Get a high level view of how an intranet will consolidate your company's needs into a single space. You'll witness how a company utilizes an intranet in their workplace and the benefits it creates. You want Social Intranet Software that makes it easy for you to organize your school's people, documents, and data. That's a given. But what about one that enables you to do more? Imagine a new kind of intranet. An intranet that your people actually find value in visiting. An intranet that unites your administrative staff, energizes your workplace, and is ridiculously easy to learn and simple to use. Communifire takes the concepts of old and clunky intranets and transforms them into an easy-to-use collaboration, communication, and knowledge management platform. You've got educators, researchers and administrative staff everywhere, but you come together to collaborate in one place. Manage your curriculum, move classroom administration online and share university experience and insight. Share your files easily with a centralized knowledge base, built right in your social intranet software. Stay connected, collaborate effectively and engage. Higher Education and Colleges accelerate information sharing with Communifire. Get everyone connected and on the same page. Keep your faculty informed and engaged. Encourage participation and creative collaboration. Plan ahead, move work forward. Join us for a live product demo. We'll walk you through the product and answer any questions you have about Communifire. Design an intranet homepage that your faculty, administrative employees and researchers will use daily and actively participate in. Communifire provides a customizable intranet homepage that you can personalize with your university logo, tag line and other concepts. You can add in information from your departments, groups and projects. Designate your homepage as the hub for instant access to news feeds and relevant information and links for your college or university. When you've got a significant update, you can highlight it to draw attention. Add feeds from popular applications. If you've got a particular design or functionality in mind for your homepage, let us know. We're happy to help and brainstorm what's possible. Then we'll create it for you free of charge. Workspaces for your departments and staff. Your university has multiple levels and groups with people working together on specific projects from different departments as needed. It is easy to form online workspaces with Communifire so you can bring just the people you need at any time to collaborate on any endeavor quickly and efficiently. Add more members at any time. Scale up or down. Keep your conversations and insight flowing within context. Get everyone connected. Equipped with powerful features, Communifire helps you decide what features you want to use right away whether it is blogging, file sharing, discussions or events. Decide how you want to set permissions for the people you invite and control privacy and moderation settings. You can also easily brand workspaces to stay organized and keep everyone engaged with recognizable logos, names and other personalization elements. Share files and documents. Keep everyone informed in any workspace through regular news updates. See your workspaces evolve into highly productive online hubs. Draw upon other Communifire features such as shared calendars, task management, document management, publishing tools and social collaboration as you need them. Get work done well and leverage the power of social business. Company directory and employee profiles. At any given day, your school, college or university faces a variety of problems and concerns. Some are new and some are recurring. It's helpful to have immediate access to knowledgeable experts who have experience in such issues and/or the skills to address such concerns and come up with viable solutions. That's where Communifire's company directory comes in handy. The directory consists of a database of all members of your Communifire account and offers rich insight. Each member has a user profile that share information such as a photograph, name, personal, work, and contact information and an activity stream. An index of the content they have created, their relationships, and the spaces and groups they participate in are also connected to each member profile. Basically, you're armed with all the information you need about your people to quickly choose the right people for any project at any time. Communifire is the best intranet software for schools and higher education organizations. Empower better decision-making and leadership. Find the right people for any endeavor at any time. Encourage knowledge sharing, speed up communications, personalize engagement and see loyalty, retention and productivity rise. Every employee profile has a personalized activity feed with dynamic content function similar to Facebook's Wall. Each member has access to a full suite of publishing tools. Members can share projects they are currently working on and status updates and expertise. Encourage feedback and spark dialogue by mentioning people (@johnsmith for example) and using hashtags (#educatorsupport). Publish news, announcements and updates. Use your Activity Stream to share news, company announcements and real-time updates. Keep information flowing so your team is informed and engaged. Add relevant content where applicable to your HomePage. Personalize individual feeds to receive information tied to each member's projects, departments and general company information. Avoid the hassles of dealing with email chains to spread information. Share insight. Offer immediate feedback using the 'like' button and comment features similar to Facebook. Work where the files are. Manage your documents and files easily with Communifire's secure document management system. Instead of waiting for emails, search for documents by the author name, project name, tags, discussions and content topic. Find what you need fast. You can pull all related conversation threads with your employee and faculty insight so you've got everything you need to make better decisions. If you are updating files whether is the university brochure, employee handbook or financial aid applications, update documents and review different versions of documents via Version Control. Tag and track changes for easy follow up later. Preview documents prior to downloading them. Find what you're looking for. Add feedback using the like button. Comment directly on documents similar to microblogging. Manage tasks. Get work done. Every day, you've got tons of tasks to be assigned and managed for every project, classroom curriculum and endeavor underway at your college or university. Managing this process does not have to be tedious or difficult. Assign and manage tasks easily with Communifire, tying tasks to project phases and scheduling. Add notes where applicable. Log in periodically to see progress. Add new tasks as each project phase gets done. Eliminate barriers and miscommunication with clearly defined project goals linked to specific tasks. Keep your workforce productive and engaged. Calendars for organizing your schedules. Your time is valuable. Excellent calendar management is essential to getting the most out of your workday. Make sure you get things done. Grow your relationships with your most important customers, students, and their parents and families. Make daily operations more efficient by using Communifire's calendar management. Add appointments, meetings and events to your personal calendar. You'll discover that Communifire's calendar is a suitable alternative to Outlook calendar and Google calendars. With its easy to use and well designed interface, there's no g curve. 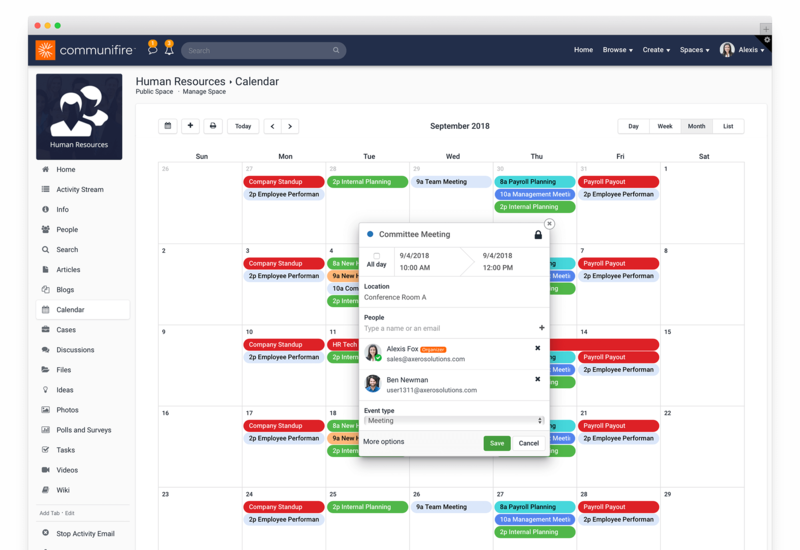 Instead, you'll hop right on there and be able to add events, schedule project meetings with reminders sent by email, invite guests and personalize categories in a cinch. Drag and drop scheduled activities into time slots. Reschedule events easily. Create events for both your personal calendar and your group, department or organization. Share events and entire calendars. Add reminders. Invite members to any event or meeting through invitations sent right from your calendar and also linked to your email. Make your workweek productive. Searching for information you need does not need to be cumbersome or take a long time. 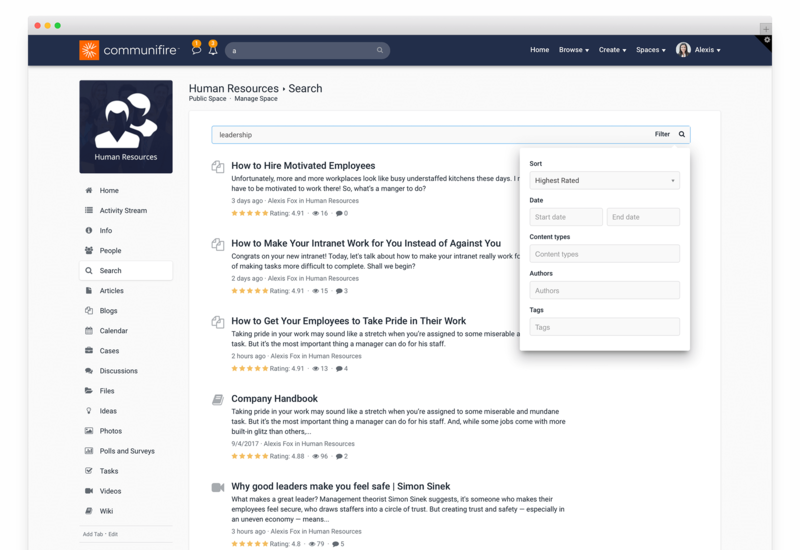 Find information you need easily and thoroughly using Communifire's Contextual Search function, which helps you not only locate specific files you are looking for but can also pull up all the relevant conversations, workforce insight, documents, files and commentary for any topic. Experience powerful, rapid search so you can make better decisions, armed with all the information you need. Having access to new knowledge instantly and seamlessly across your college or university keeps everyone connected and on the same page. Access your knowledge based from anywhere, using any browser and device you choose. Connect and collaborate easily. Liberate your team from information silos. Speed up communications and make it easy to collaborate, learn and get work done. Access the information you need when you need it via Communifire's centralized knowledge base where you can search and find all the information on any topic. Create groups for specific projects, using shared online workspaces. Invite more members as you need. Be productive and get work done. You've got a ton of data but for it to be actionable, you need your information to be organized and easily accessible. Communifire makes it easy to get and stay organized. Foster an open, collaborative environment where your workforce engages and shares their ideas and experiences. Receive insight within context. Increase engagement in your educators and staff and see their loyalty translate to better service. See your customers from students to parents and partners, engage and invest. Unleash the power of the Communifire platform. 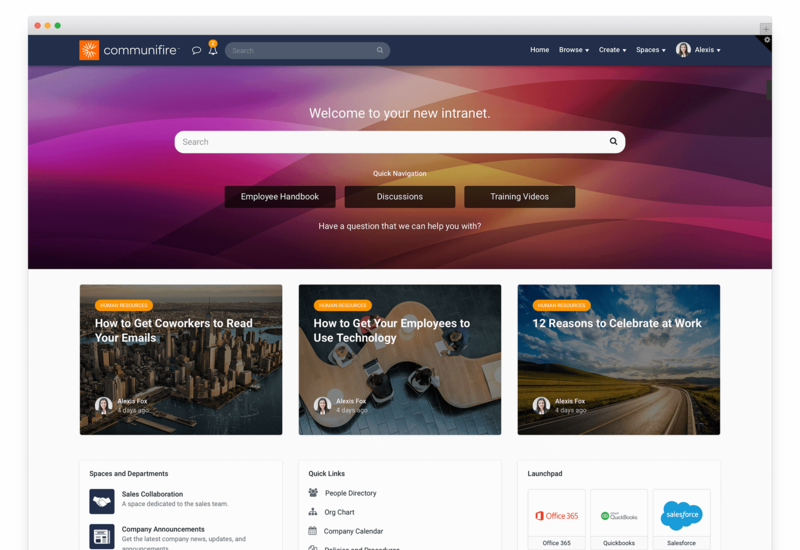 Communifire is your modern, fully featured social intranet platform that supports your employees and your business. 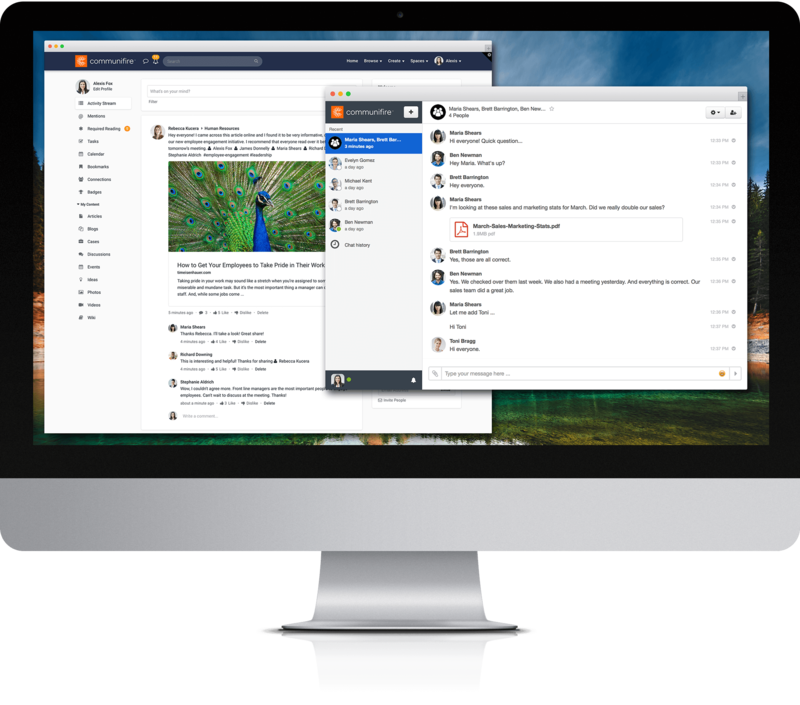 From connecting your people and streamlining communication to enhancing collaboration and managing content, our full suite of integrated tools will help your organization be more informed, quicker to take action and prepared for tomorrow. From activity streams and notifications to task management and calendars, these apps will keep you in-the-know and your projects on track. File & document management, blogs, polls, wikis and more. Everything you need to manage your business, work together and get real results. Make your organization come alive. Your new company directory and personal profiles help put faces to names, break down silos, and find the right person at the right time. Where everyone in your organization comes together. For a project, an interest group, specific topic or connecting departments - this is the place for collaboration. Your security is our priority. Get all the technical and security details on why Communifire is the most powerful, flexible and reliable intranet platform for your business. Gain access and download all of the Communifire product details, documents, and spec sheets for free. Share them with your colleagues or read them later.